During January and February, Centurion hosted the fourth annual Vacation Program which offers tertiary students the opportunity to gain valuable experience in their chosen discipline. Students worked on meaningful projects and alongside company managers. They worked in the Human Resources, Health and Safety, Business Law, Project Management, and Logistics and Supply Chain departments. 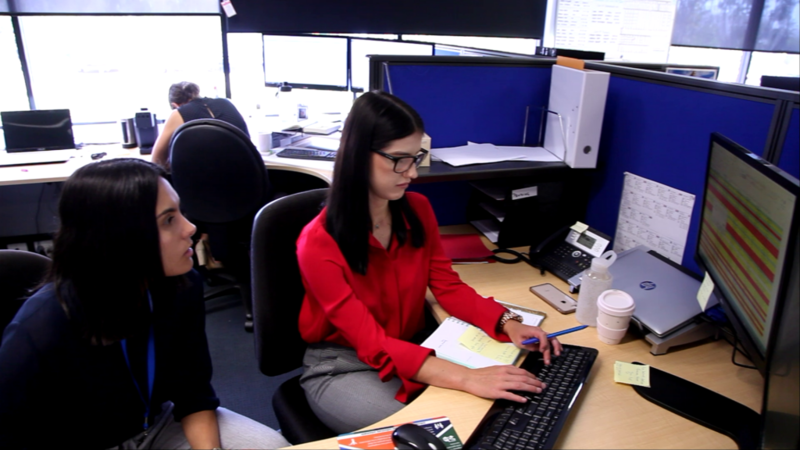 Centurion HR Vacation Student Lauren learning from HR Administrator Lilly during the program. Each student is provided with a mentor along with their manager to help guide them during their time at Centurion. In addition, a weekly meeting is hosted every Friday with guest speakers from around the business sharing their career experiences and advice. As a part of the program students also worked together to organise activities to raise money for the Telethon Kids Institute, which allows them to practice and learn skills vital in a successful workplace such as teamwork, organization and accountability. Some of the fundraising initiatives the students implemented included the ever popular sausage sizzle, swear jars, guess the number of lollies in the jar, as well as a silent auction for some award winning wine and a dinner voucher raffle. CEO Justin Cardaci said that the fundraising activities are a good way for the students to work together and develop important skills. “This project allows them to practice and learn skills vital in a successful workplace such as teamwork, organisation and accountability,” he said. A fundraising idea that won’t be forgotten and that set this year’s cohort apart was the challenge given to the Leadership Team. If enough money was raised Centurion’s Divisional Manager Yard Operations Darren Fox would have a bucket of ice water poured over him, CFO Grant Gardner would have his head shaved and CEO Justin Caradci would shave his beard. The honour of shaving Grant’s head was given to Executive General Manager Operations West Gary Nurick after multiple donators nominated him for the job. Amid the calls for more impromptu donations Centurion’s General Manager Finance Gareth Parry stepped up and also had his head shaved for the cause. Well done! 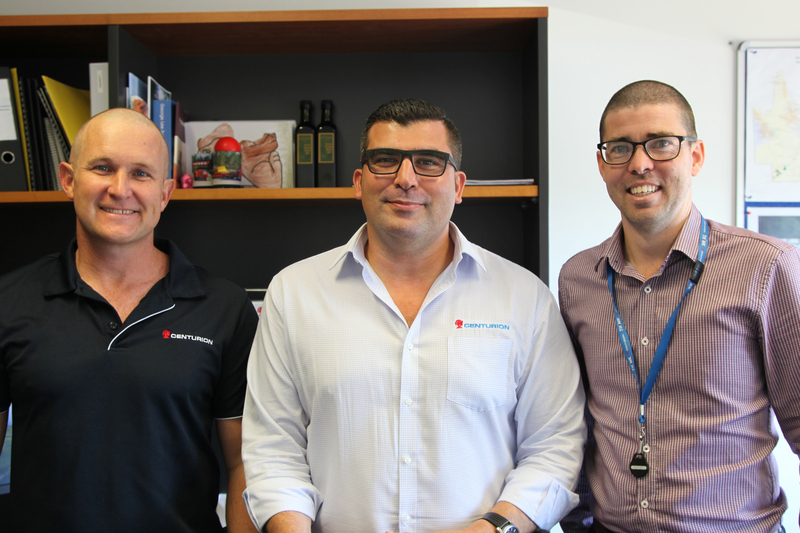 CFO Grant Gardner, CEO Justin Cardaci and General Manager Finance Gareth Parry after their fundraising challenge. The funds raised were matched by Centurion resulting in $5120 being donated to the institute. The students were then invited to visit the Telethon Kids centre and learn about how the money will be used throughout the company. During the Institute visit, the students toured the labs and offices and caught up with researcher Aarti Saiganesh, from the Strep A team, who showed them flesh-eating bacteria. They also got a sneak peak of Telethon Kids’ new Discovery Centre and spoke with researcher Kristen White about Telethon Kids Kimberley, a permanent base set up in Broome to deliver better health outcomes for Aboriginal children in the region (Centurion employees raised money for a specialised 4WD for Telethon Kids Kimberley researchers). Head of Development Tim McInnis thanked Centurion for their ongoing support. “Every donor at any level of giving is essential to the whole of what Telethon Kids Institute undertakes daily,” he said. Centurion’s DM Yard Operations Darren Fox having the ice bucket poured over him after the fundraising targets were met.